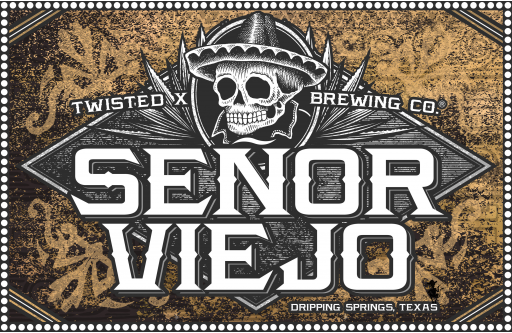 Señor Viejo from Twisted X is a true "Tex Mex Beer"
Although it's a bit of a cliché, the phrase "a new twist on an old classic" is something that surely applies to Señor Viejo from the Twisted X Brewing Company of Dripping Springs. You see, Señor Viejo translates to English as "very old man" or "the old one" according to the brewery's website, though Google Translate seems to think it means "Mr. Old." In any case, what's old about Señor Viejo is that it's based on a German schwarzbier, a style of beer that dates back to at least the 1500s. As for what's new, that has to do with a little something we know today as barrel aging. Señor Viejo has been around since 2011, but the summer of 2014 was the first time it saw the light of day in bottles. Classified as an imperial black lager, the current incarnation of this beer spends time in 10-gallon barrels that once house not only Garrison Brothers Texas Straight Bourbon Whiskey, but also Dulce Vida Lone Star Edition Añejo Tequila. The combination of Texas-made spirits, couple with tequila's origins in Mexico, means Señor Viejo is nothing if not the embodiment of the brewery's slogan, "Tex Mex Beer." So, how does it taste? In a word, good, though for those whose ears might perk up at the very thought of this being a bourbon barrel beer, that aspect of Señor Viejo is decidedly less forward than the rest. For me, the real draw is the tequila element and how the agave interacts with the qualities of the base beer. In fact, my tasting notes nearly mirror the words of the brewery in talking about how the sweetness of the agave counterbalances the slightly bitter tones of the roasted malt. Twisted X calls it softening, whereas I describe it as taking the edge off, but in my mind we're saying essentially the same thing. Back to the bourbon, it sneaks out more as the beer comes up in temperature, as does a hint of dark chocolate. Neither tries to steal the show, however, with both simply contributing to the overall complexity. The bourbon might add a bit of booze to the back end, but that's the only real evidence of the beer's boosted ABV. Other than that, flavors tend to stay true throughout both flavor and aroma. As for the finish, it's a mix a drying oak tannins and a roasty flourish that lingers well into the aftertaste. That last part being perhaps a subtle reminder of the seemingly solid foundation this beer is built upon. Given that, one wonders if the brewery would ever consider releasing Señor Viejo as a non-barrel aged brew. Now, I can imagine a barrel head drinking this beer and saying it doesn't have enough booze. Imperialized or not, though, this is still a schwarzbier, and too much bourbon (or agave for that matter) would easily overwhelm the underlying lager. Rather than that, Twisted X has created a system of checks and balances in letting the sweetness of the agave play off the roasted malt. In doing so, I think they've created a rather unique taste experience, but whether or not you agree may come down to how you feel about the flavor of tequila. As for myself, while a bottle of tequila isn't the fist thing I would reach for at a bar, in this beer it works. * Originally published on Tenemu.com. Labels: barrel aged beers, Señor Viejo, Tex Mex Beer, Twisted X Brewing Co.